It’s the start of the new term at Guides and as usual we have some new starters. I do my Guiding in a fairly rural area, so most of the Guides know each other from the main school in the village, but it seems that there is a huge gulf between the lofty year 7’s and the new year 5’s. Looking for some new ideas, I stumbled across icebreakers.ws which has a number of interesting games to get everyone talking and learning more about each other. Who knows, they may actually find out that the year 6’s aren’t an alien species and are quite interesting! I’ve tried the Bingo style games before where you have a sheet of paper and have to go around finding someone who has an elder brother, someone who is left-handed and someone who can’t stand One Direction. This is good at making the Guides talk to people outside of their normal friend group because Nancy the new girl is the only one with a hamster, and if they want to get that signed off, they need to share the fact that they hate marmite. Another suggestion on the website is the blanket game where you hide one person behind a blanket and everyone else tries to guess who it is. I find this works best when you know each other a bit first. Rainbows won’t peek while you are hiding someone, but Guides aren’t beyond a bit of cheating. Or is it just mine? I think I’ll be trying the connecting stories game within the new patrols. One person starts off a story such as “I had jam on toast for breakfast this morning” and then the next person needs to provide an anecdote related to this such as “my mum made strawberry jam this summer” followed by someone else’s “I went to a pick your own farm and we picked 3 punnets of delicious strawberries”. The linked stories have to carry on as long as possible. With my old unit, I played the “move to the left” game where everyone sits in a circle on their own chair. The person in the middle makes a statement such as “move to the left if you have an older brother”. Anyone this applies to has to move to the left and sit in the next chair. If a Guide doesn’t have an older brother, they stay put, which can mean they get someone sat on their lap. If there is a complete pile up, you can rescue the poor unfortunate Guide left sitting underneath 4 others by making a statement that you know applies to her alone. 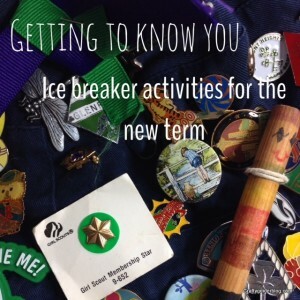 Do you have any good ice breaker activities to share? Girlguiding is the leading charity for girls and young women in the UK, with 553,633 members. Thanks to the dedication and support of 100,000 amazing volunteers, we are active in every part of the UK, giving girls and young women a space where they can be themselves, have fun, build brilliant friendships, gain valuable life skills and make a positive difference to their lives and their communities. We build girls’ confidence and raise their aspirations. We give them the chance to discover their full potential and encourage them to be a powerful force for good. We give them a space to have fun. We run Rainbows (5—7 years), Brownies (7—10 years), Guides (10—14 years) and The Senior Section (14—25 years). If you can give some time to help support or lead a unit, just click here or call 0800 1 69 59 01.